Time is running short in the race for the District 3-6A championship and the four playoff teams look pretty much set. Abilene and Fossil Ridge clinched postseason berths last night while Keller Central and Keller HS are in fine shape to be the other representatives for the knockout rounds. The four schools have some jockeying for final position at stake over the final two weeks. It has become Abilene's title to lose. With a penalty win at Keller Central and a win last night over Timber Creek, Abilene has asserted their power taking over the title race. 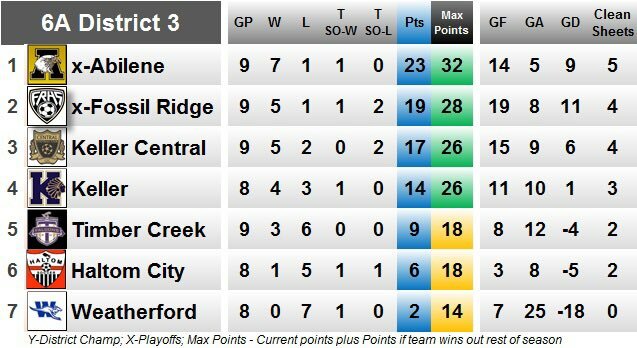 They now sit four points clear of faltering Fossil Ridge. The two are set for a season ending showdown at Fossil Ridge but Abilene could have the title wrapped up by that point if they take care of business against Weatherford and Haltom. The other team making the move in the district of late is Keller HS. After a slow start the Indians are on a roll. Last night they beat Fossil Ridge 2-0 on home turf. A playoff berth looks a certainty, but their sights are suddenly set upon a higher finish. Keller gets CFC at home on Friday. A positive result in that one and Keller could conceivably get all the way up to 2nd place by the end. After Central their final three matches are against the bottom three in the district. After ending the first half of the district schedule on top, Fossil has faltered of late. Dropping points at lowly Haltom and then losing to red hot Keller has left Fossil's title hopes on a string. Not only that, but they are in real danger of falling farther than just second place. Central and Keller are hot on their heels and the schedule ahead is tough with a visit to CFC and a home match with Abilene remaining. They'll need at least two results in the final three to hold onto 2nd. Keller Central got a much needed win over Timber Creek last night. It was a nice boost of confidence after the home penalty kick loss to Abilene Friday. CFC has everything left to play for with a finish anywhere from 2nd to 4th still in the balance. Their fate is completely in their own hands as they face Keller and Fossil in their next two. Grab wins and they probably go 2nd. Lose and they probably go 4th. Drama! Friday is a huge matchnight in District 3-6A. The Central at Keller match is huge for both team's prospects. Can Keller continue their climb? Fossil Ridge has the bye and will sit at home. The best result for them would be a Keller win in penalty kicks which would keep Fossil in 2nd place. Timber Creek will hope for a Keller loss and a win at home against Haltom to keep their slim playoff hopes alive. Meanwhile, Abilene can just about wrap up the title with a win at home against last place Weatherford.